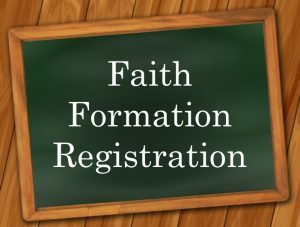 Sign up now for faith formation classes for the 2019/20 school year! Don’t wait! Register now for Grades 1-5 & First Holy Communion to get the day and time that works for your schedule. Please see Peggy, Pam, or Gina in the parish office or email Peggy at peggy.cloutier@sainttims.org. Click here for registration form packet – Grades 1-5! Sessions for grades 1,3,4, and 5 will be held Sunday 10:30-11:45 and Monday 4:30-5:45. Want more info? Click here. First Holy Communion preparation sessions will be held Sunday 10:30-12:00 and Monday 4:30-6:00. Want more info? Click here. Children must attend 1st grade faith formation classes to make First Reconciliation and First Holy Communion in 2nd grade. Children attending Catholic School register for sacramental preparation sessions (FHC) at the parish to make their First Reconciliation and First Holy Communion in 2nd grade. For more info about Confirmation, click here. Click here for registration form packet – Grades 6-12!